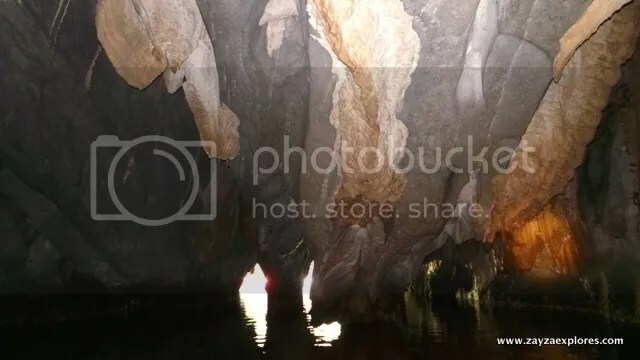 A UNESCO Heritage Site, never miss visiting Puerto Princesa Subterranean River National Park also known as Puerto Princesa Underground River (PPUR) when in Puerto Princesa. 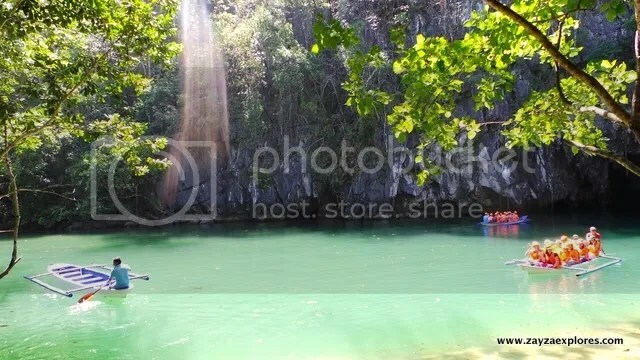 The national park is located in the Saint Paul Mountain Range and is part of the West Philippine Sea. Since 1992 it is being managed by the city government. In 2012 it was named as one of the New Seven Wonders of Nature so getting visitor’s entry permit gets a bit stricter and harder. It’s better to secure this before flying to Palawan. 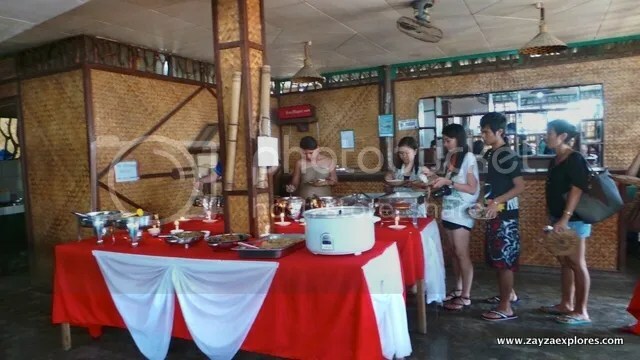 Most of the time it is fully booked especially during summer as they expect huge influx of tourists. There are also guidelines to follow. Since our tour were booked with a travel agency all these were taken care before our arrival. 5:45 AM – Early breakfast. We have to wake up 5 AM as we have an early call time. We have to be ready when the van arrives to pick us. 6:20 AM – We left Havila Bed and Breakfast. We brought all our things with us because after the tour we plan to go somewhere else or straight to the airport. While inside the van our guide Ate Aileen (from the travel agency) explains a bit of history of the underground river, our itinerary and what to do and expect from the tour. From PPS to Sabang it will take usually two hours travel time. 7:45 AM – Stop over at Jazz’ Souvenir and Cafeteria. Public toilets available here as well. From here to Sabang it will take us 20 minutes. 8:20 AM – Arrived in Sabang. 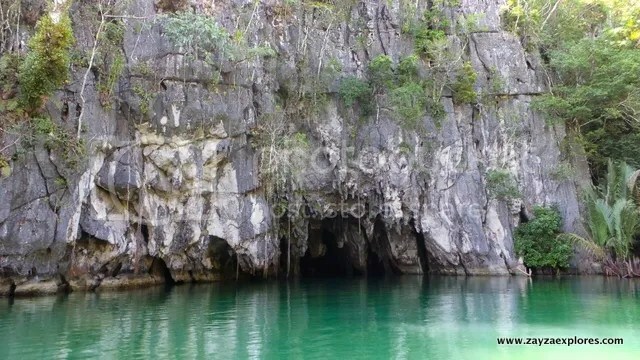 It is a small village in Puerto Princesa and the gateway to the underground river. 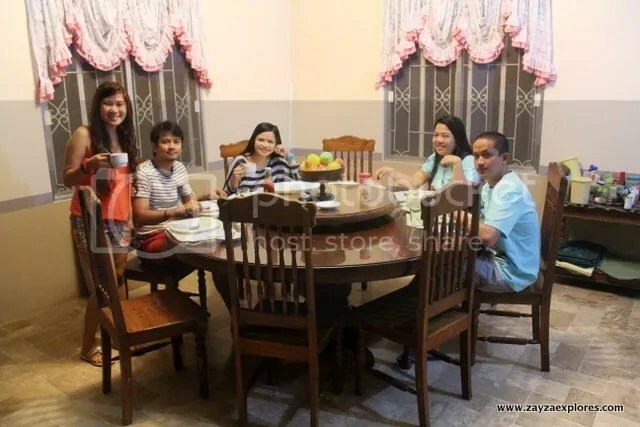 We were seated upon arrival while Ate Aileen registers for us. We have to wait for our group to be called. Tours are pretty organize. 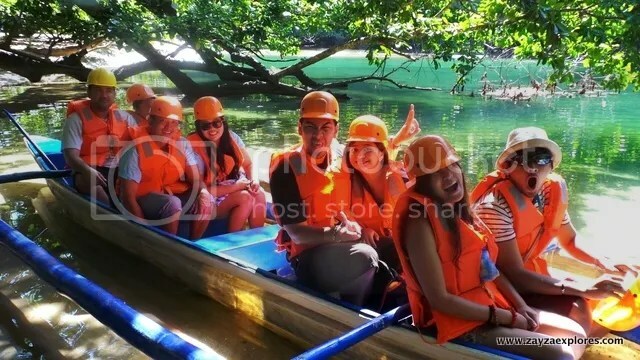 To get to the famed Puerto Princesa Subterranean River National Park you have to take a 15 to 20-minute motorized boat ride to the wharf. TIP: While on the boat don’t missed to look around and enjoy the stunning view. Indeed a beautiful creation of God. 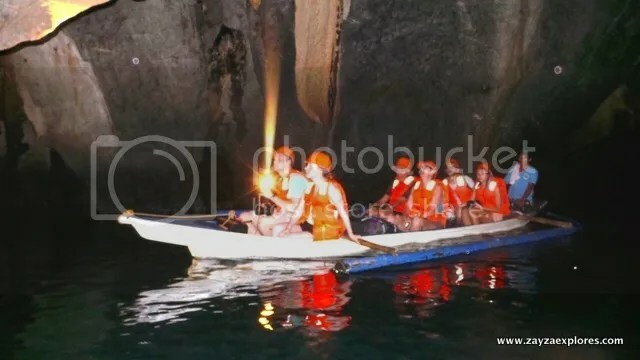 Upon arrival there’s a short walk to the entrance of the underground river. There, paddle boats are waiting. You have to register again. Here we are already in the paddle boat and so hyped to start the tour. 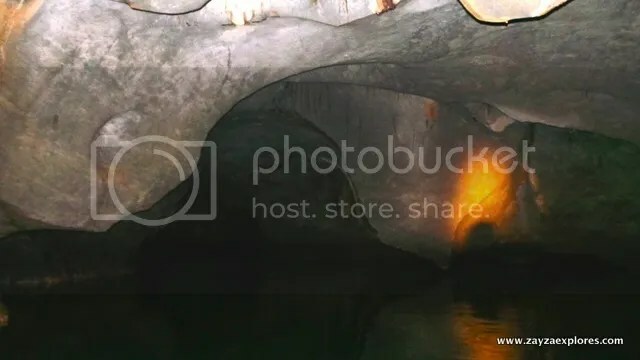 Puerto Princesa Underground River is 8.2 km long and is actually one of the world’s longest and navigable underground river. For the regular tourist tour though, we’re only seeing the 1.2 km part of it. 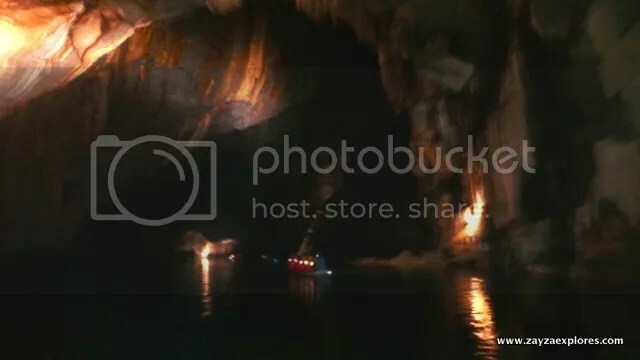 Cave’s entrance. 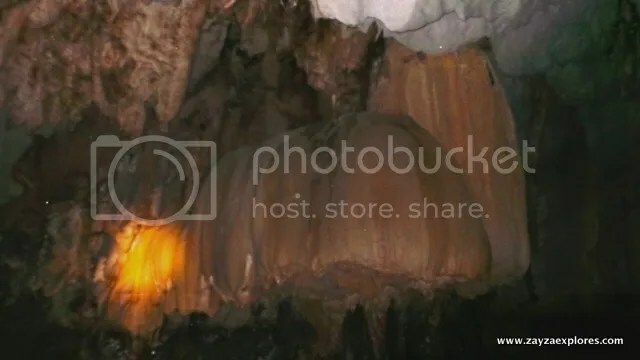 Say hello to the Puerto Princesa Subterranean River National Park! 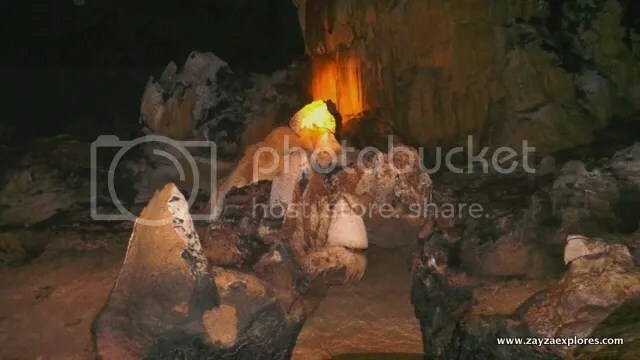 Inside it’s dark, you’ll see caves with major formations of stalactites and stalagmites. 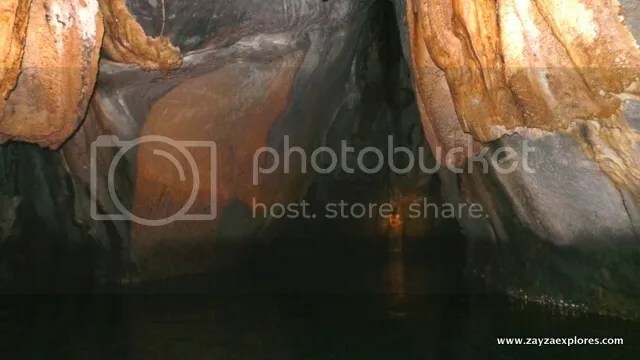 The smell is also not that good, mainly because of the bats who inhabited the place and for sure there’s a lot of them hanging on the cave. But I don’t mind them, I’m just in awe the whole time I’m inside. 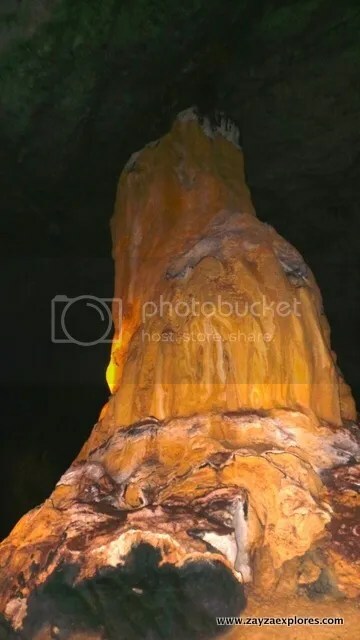 Each of stalactites and stalagmites has a name depicting the images they were named after. Here you’ll see cathedral, Holy Family, Mama Mary and there’s even a vegetable section. It’s really deserving to be part of the Seven Wonders of the World. The tour inside is about 45 minutes to 1 hour and is not boring at all. 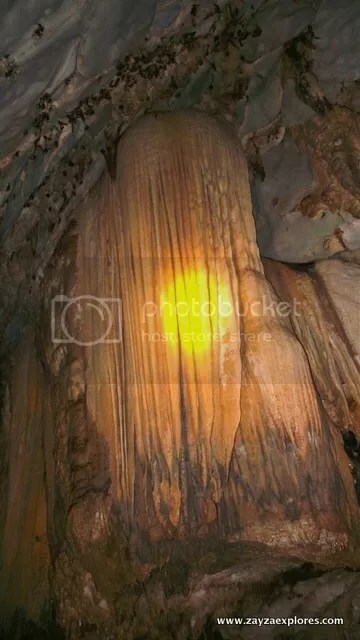 Aside from being fascinated by this natural wonder, you’ll be entertained by tour guides. 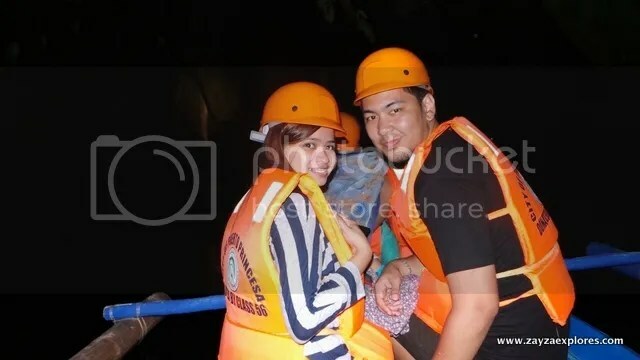 They throw in punchlines and jokes aside from the usual facts/information they give about the underground river. 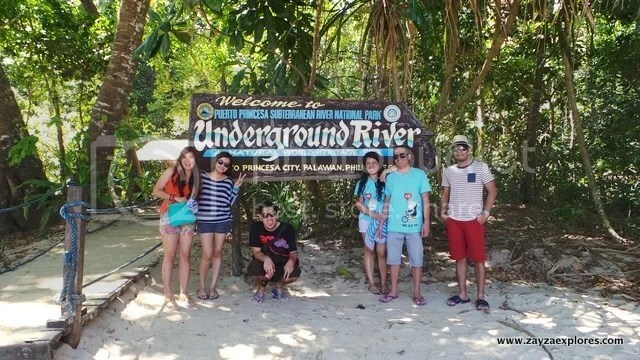 We were refrained from taking pictures from this welcome sign of the underground river when we arrived. So now that the tour is over, how can me miss this right? We’re newly weds so I guess we have an excuse for wearing couple shirts. Lol. 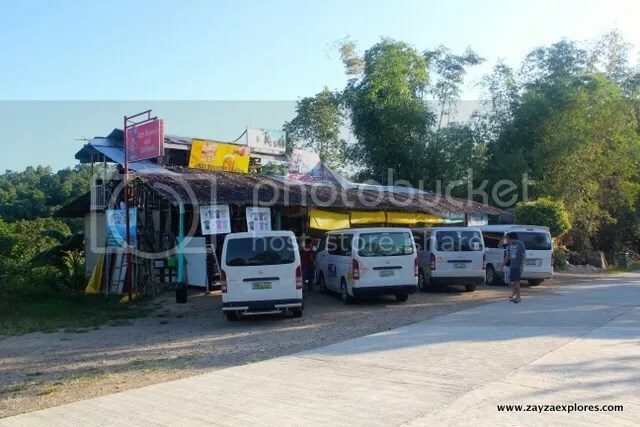 At our back is the docking area of boats from Sabang to the underground river. 11:00 AM – We’re back in Sabang. Ate Aileen is still with us, this time guiding us to the place for our buffet lunch. It is still included in the tour package we booked with them. So here we are at the Gusto Grill and Restaurant it’s just a walking distance from the Sabang port. 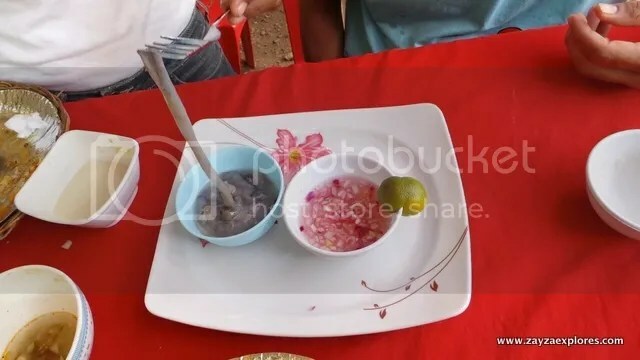 There’s a makulit girl who sells tamilok near our table. 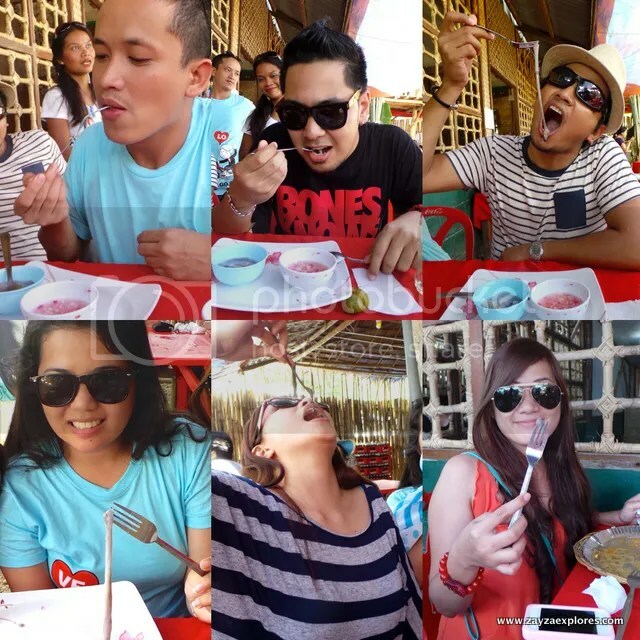 She keeps on pestering us (but in a nice way) to try it for P100 so we gave in and give it a try. So what is tamilok? 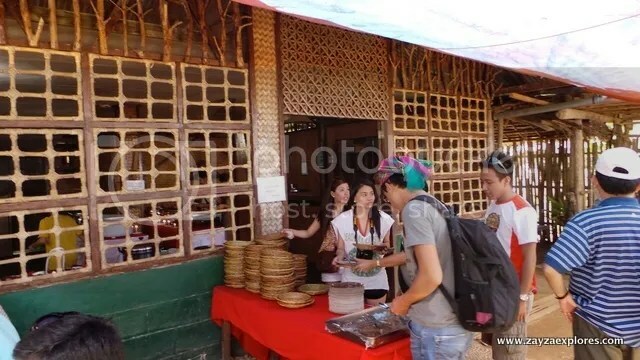 Tamilok (woodworm) is a famous local delicacy in Palawan. It looks like a worm but it’s actually a mollusk and usually thrives in rotting mangroves. 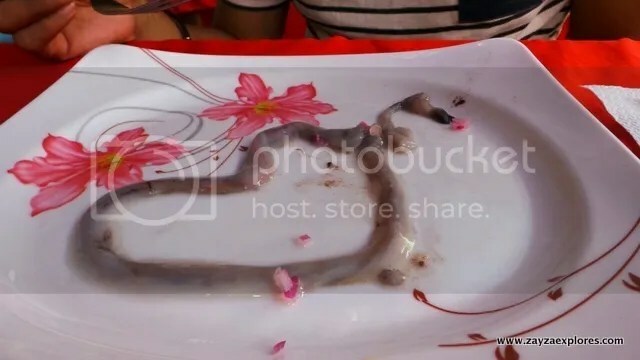 You eat it raw, just dunked dipped it in a vinegar and its ready to be eaten. 12:20 PM – We left Sabang to go back to the city. 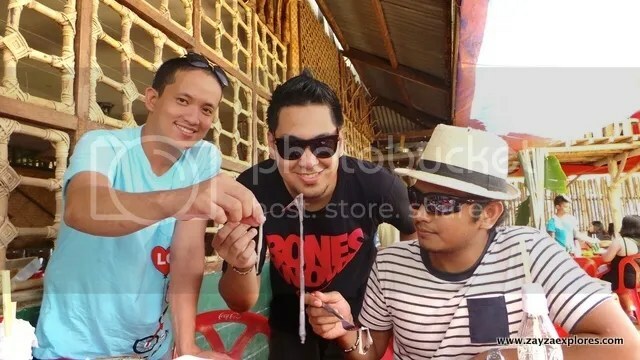 We asked to be dropped at Robinson’s Puerto Princesa to kill time since our flight is 5:45 PM.